Dr. Ashraf Omar is a pulmonologist in Los Angeles, California. Dr. Omar get is diploma in 1993, from University of Alexandria, Faculty of Medicine, in Egypt. He completed his medical studies at University of Arizona, where he did his fellowship in pulmonary disease and critical care medicine. He is board certified in critical care medicine, internal medicine, pulmonary disease and sleep medicine. 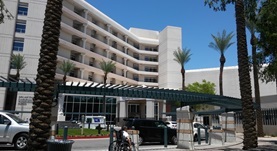 Dr. Omar is affiliate with St. Joseph’s Hospital and Medical Center in Phoenix, Arizona and Canyon Vista Medical Center, from Sierra Vista, Arizona. He is certified by American Board of Internal Medicine, in critical care medicine and pulmonary disease.